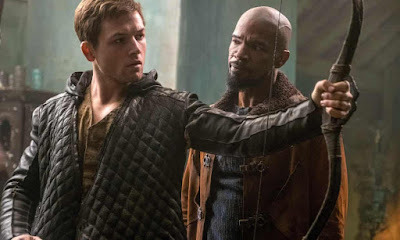 Otto Bathurst's remake of the Robin Hood myth is a dismal effort. His directorial style is sub Guy Ritchie - all mockney bovver without any of Ritchie's kinetic energy or wit. The resulting film is a CGI heavy mess, full of dull action scenes and bad performances acting out a worse script. Lead actor Taron Egerton has none of the charm or glee of his KINGSMAN role playing "Rob". Eve Hewson is very pretty as his working class girlfriend Marion, but she has to also play a woman who thinks her boyfriend died in the crusades, only to find him inconveniently alive while she's shacked up with Jamie Dornan's Will Scarlett. Neither she nor the script betray the requisite emotional depth or range to pull off that storyline. And WTF is Dornan doing here? Recent turns on UK TV show he's actually a very good actor. He's definitely playing well below himself here. The same can be said of Ben Mendelsohn doing that evil villain thing he's done countless times before, not least in ROGUE ONE. He looks bored doing it, so it's no surprise we're bored seeing it. As for F Murray Abraham - magisterial in AMADEUS - he's utterly anonymous here. Avoid at all costs. ROBIN HOOD is rated PG-13 and has a running time of 116 minutes. It was released last year and is now available to rent and own.